Tilapia has always been my favorite fish to eat. It’s very low in Points, and it is so delicate and mild tasting, which makes it a great canvas for lots of exciting toppings and sauces. 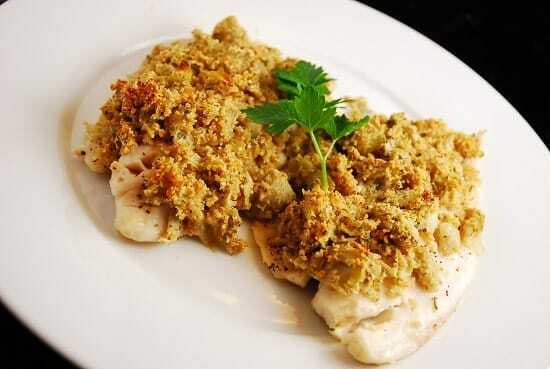 This Artichoke and Parmesan Tilapia Recipe is very simple, and takes just minutes to prepare. Yet, it is so flavorful and light. This is a great healthy fish recipe to make when you are having a busy day and not much time or energy is left to put into cooking dinner. Each delicious serving is just 3 Points, which leaves plenty of extra Points on hand for dessert, or maybe a more carb-heavy side dish, liked roasted/mashed potatoes, or a pasta salad. This is definitely a great tilapia recipe to keep on hand for when you need dinner in a pinch. Enjoy! A perfect, low calorie fish recipe, this artichoke and parmesan covered tilapia is not only incredibly delicious, but I has only 3 Points per serving. It goes great with some roasted potatoes and salad, to make a complete meal. Preheat oven to 375 degrees. Line a rimmed baking sheet with parchment paper and mist with an olive oil mister or non-fat cooking spray. Wash fish fillets, pat them dry and then season both sides with salt and pepper. Place them on baking sheet. In a medium sized bowl, combine artichoke hearts, parmesan, breadcrumbs, oregano, and lemon juice. Top each fillet with artichoke mixture, and place in oven. Bake in oven for about 15-20 minutes or until fish is cooked through and flakes easily. How many Smart Points ? This was delicious and so easy to make. Thank you! This turned out really good! I recently bought several bags of frozen tilapia because it was on sale. The first meal I made with it my boyfriend announced that he isn’t really fond of tilapia anymore. Since then I have been trying to find some really unique recipes to use it up in. This one has been the best so far, and my boyfriend even said it was great. I’d give it 4/5 stars! Thank you so much for this recipe … we loved it and will definitely make it again. This looks so yummy! And I LOVE that it’s only 3 points per serving. Love your site.